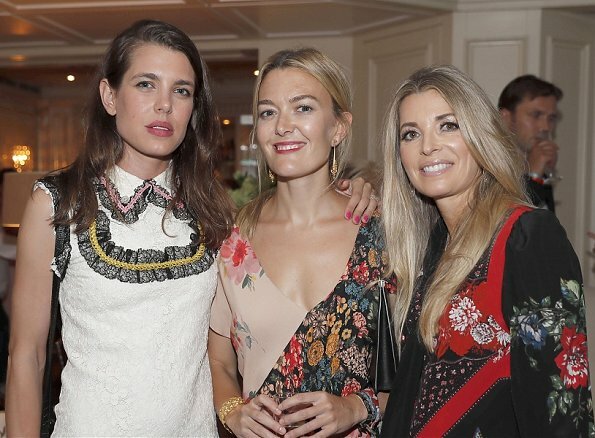 Charlotte Casiraghi (with Marta Ortega and Edwina Tops-Alexander) attended the 2017 Longines Global Champions tour closing party held at the Monte Carlo Casino in Monte-Carlo, Monaco. 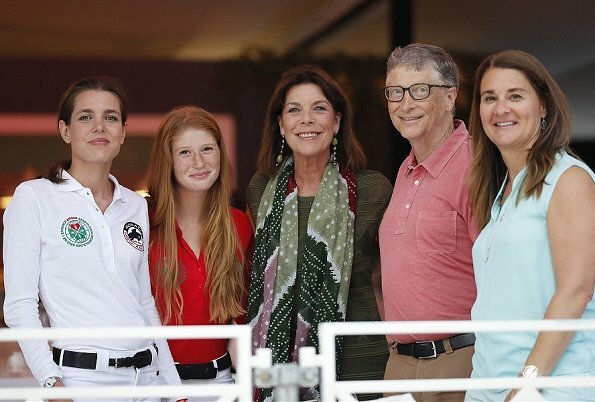 Princess Caroline of Hanover, Charlotte Casiraghi, Bill Gates and Melinda Gates attended the International of Monaco horse jumping competition as part of the Longines Global Champions Tour in Monaco. OMG, Charlotte, you're not a 10 year old going to a friends birthday party. That dress has to be one of the most ridiculous things she's ever worn. She has beauty but no brains where fashion sense is concerned. The Gucci dress is adorable. We need to see her dressed in full. She has really nice face and a lot money to spend, but somehow, she always manages to look bad. Greasy hair, bad hairstyle, bad posture, awful outfits. What's wrong? Is that considered "cool" in Monaco? I see Monaco RF has different style in clothing than other royals but Charlotte is really the worst. Agree. This today´s fashion is very unbecoming and ugly. Then look how good and relaxed she looks in riding clothes. They are like two different persons. Blondiini, she doesn't seem to be interested in fashion, as long as the costumes are sponsored... As I noticed ones, Royals- and what happens after their 30th birthdays.. Everyone who's got a brain, can notice it. Rainha; if I had no interest in fashion, I would try my best to avoid those silly high fashion clothes and events. But she seems to be in every single one with her mostly totally tasteless fellow rich and nobel loafer friends. Maybe it is also high fashion to look just so bored. Blondiini, you are right. Deep inside, maybe there is a "tristesse" in Charlotte, I guess... Or is she just bored with her jet-set-live? However, she looks her best in Jeans, trenchcoat, loafers or her riding-outfits. True. All the gifts from the Gods,and she really could send out that beauty. But mostly I see just boredom and arrogance. Charlotte's dress is pretty! It's different, young and fresh. I think she looks great in the second picture with Polo Shirt. And Caroline has a beautiful smile. Charlotte always looks better in sportif clothes and seems to always look miserable when she has to dress up for official occasions. Maybe she is a very shy Person. Myriam, c'est triste mais c'est vrais. Truly, the designer dress on Charlotte looks like some of my first sewing attempts using ruffles and rickrack when I was 18. The armholes are especially poorly done. If I were her I would just quit the fashion business modeling and enjoy the sporting life. Her Aunt Stephanie doesn't seem to care one speck about beauty and clothes. Charlotte might be able to enjoy her life a lot more. She is a prisoner of her face. She does not have to be a prisoner of her face, she's rich, rich enough not to need sponsors, or to model ugly clothes. What is sad is that so many 'celebrities' and even their kids are sought after for their name to endorse everything under the sun. These people also don't need the money, but they do it anyway. I More money, more exposure. And you were good, K. Hass, if your first sewing attempts were like that. Maybe she likes their clothes and sees the sponsorship as an opportunity to be a bit "wacky"? When she's not wearing their clothes she has a more relaxed, simpler style. She's on record as saying she does it as it allows her to have her horses which is an expensive hobby. That said, I think she looks fine - it's a pretty enough little dress.